This interesting and unusual surname is of early medieval English origin, and is from the medieval given name "Han(n)", which is usually a short form of Johan, from the Hebrew name "Yochanan", meaning Jehovah has favoured (me with a son), or may Jehovah favour (this child). However, in some cases, the name may be from the personal name Henry, which is composed of the Germanic elements "haim, heim", home, and "ric", power, and even from Randolph, which is also from a Germanic personal name, composed of the elements "rand", rim (of a shield), shield and "wolf", wolf. 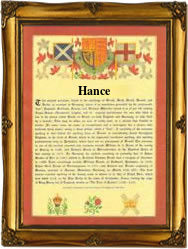 The modern surname can be found as Hann, Han and Hane, and the patronymics include Hance, Hanson and Hansom. Among the recordings from London Church Registers include: the marriage of Joseph Hann and Mary Luis, on October 31st 1706, at St. James's, Dukes Place; and the christening of Henry, son of Thomas and Elennor Hann, in July 1750 at St. Anne's, Soho, Westminster. The marriage was also recorded in London of Frederick Hann and Frances Taylor, on November 10th 1816, at St. Martin in the Fields, Westminster. The first recorded spelling of the family name is shown to be that of Richard Hannesone, which was dated 1379, in the "Records of the Borough of Nottingham", during the reign of King Richard 11, known as "Richard of Bordeaux", 1377 - 1399. Surnames became necessary when governments introduced personal taxation. In England this was known as Poll Tax. Throughout the centuries, surnames in every country have continued to "develop" often leading to astonishing variants of the original spelling.